Looking for some beautiful and functional Ceiling designs for office? 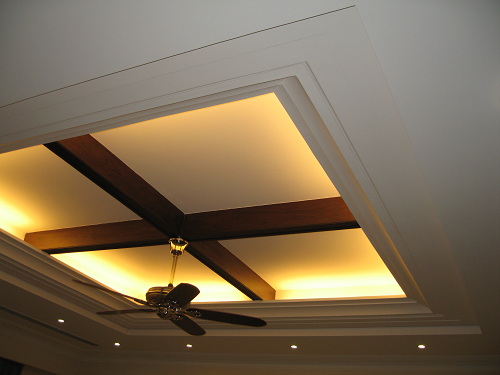 Read on about false ceiling, POP ceiling, and Wooden Ceiling design for office decoration. Ceiling plays an important role in your office decoration so it should be designed in way that it should leave a right massage about your working environment and functional too. A good ceiling is not only looks beautiful but it also sever many purposes like it makes the room sound proof, provide some extra light, can be used for displaying your office logo and on. 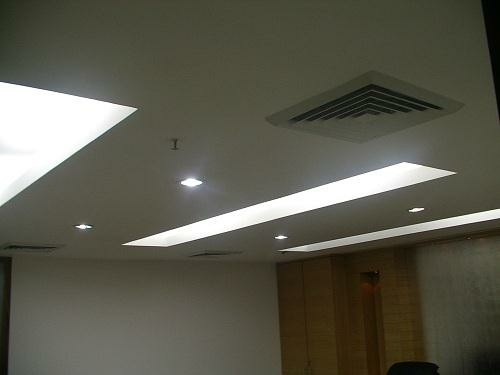 So you should be careful while selecting Ceiling designs for office. 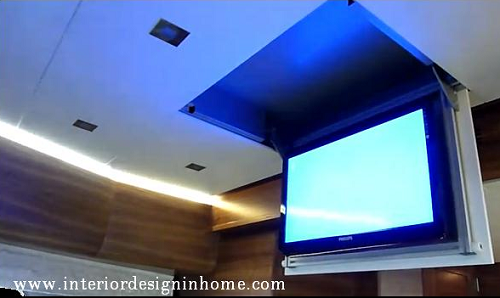 False ceiling are suspended a few inches below the structural ceiling on a metal framework which can be constructed of any lightweight construction material like plywood, light-wood, Plaster of Paris, gypsum, veneer depending upon the budget or the requirement of the place or clients. False ceiling for office can serve many purposes like it will help you to cover any odds in your primary ceiling and can cover the wiring system in the room very cleverly. False ceiling in offices can host sprinklers for fire emergencies and used for centralized AC which can reduce the overall cost of electricity. Lights can be inset into a false ceiling, which prevents having to dust them while providing you with a clean, level surface below. Colors of the ceilings should not be very dark as lot of colors can disturb the concentration which is not ideal for the office. Choose light colors such as white, beige, light blue for ceilings. Choose the color of the ceiling according to the color scheme of your office. You can accessorize the false ceiling with some hangings like your company logo, hanging lights, projector or TV but it should not be very low otherwise it will create mishaps. Lighting plays an important role in office decorations and improves the functionality of the place also so choose the lighting fixture carefully. If you have false ceiling in your office then you can use Recessed lights, small-sized spotlights, Surface fixtures include ceiling lamps, hanging lamps to get good amount of light. It is very easy to take care of Drop ceilings, false ceilings can be cleaned easily by dusting only use a feather or static duster or vacuum cleaner with attachments to remove dust and spider webs from the ceilings. It is good to clean them once in a week so that it looks clean and beautiful. Wash a stained or splattered ceiling tile using a cellulose sponge, slightly dampened with water.